Think back and remember – how long has it been since you’ve used a compass? An actual compass. You’re probably imagining the 1800’s Amazonian adventure movie where the hero used a compass, or wondering where that old compass your grandpa gave you ended up. While simple compasses seem to become more and more outdated with the rise of GPS devices, smart watches, and the like, having a compass to rely on during your outdoor adventures may still be a very good idea. Compasses tell your position in relation to the rest of the world, and what direction you may need to head if you find yourself lost on the trail. For serious backpackers, hikers, and survivalists, having a reliable compass may mean the difference between life and death. Don’t believe us? Even the U.S. military still relies on compasses in training and in the field (which you can check out or even purchase here – CMMG Official US Military Tritium Lensatic Compass). With the progression of technology, compasses have grown from a simple magnetic needle to liquid-filled magnetized capsules, and now, you can even have the convenience of a compass on your phone. 3.0.1 Q: Is a compass app the same as a compass? 3.0.2 Q: Does a compass app replace a real compass? 3.0.3 Q: What Phones can use a compass app? 3.0.4 Q: I am new to navigation, what app is best to learn? 3.0.5 Q: How does a compass app differ from a GPS app? 3.0.6 Q: How accurate are compass apps? Having a compass app on your phone (or tablet, or computer) is an easy way to rely on a compass on-the-go, without ever having to use an actual compass. 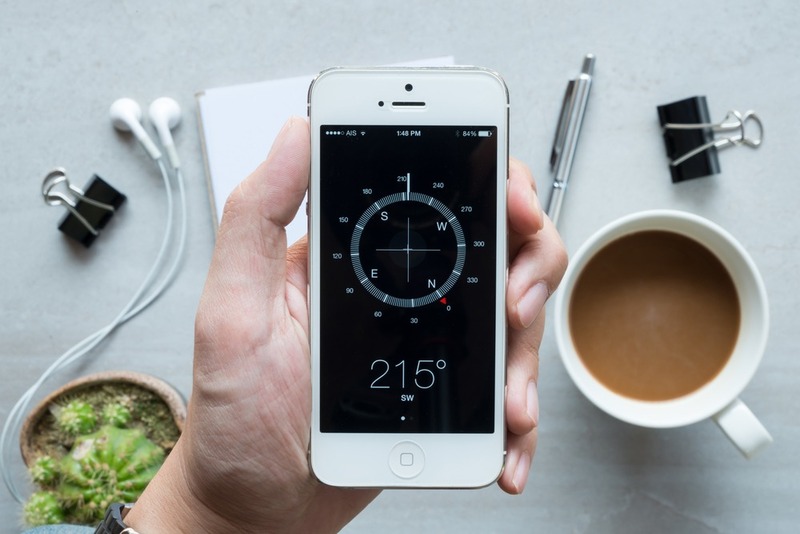 However, while compass apps may be convenient and hassle-free, some may not be as accurate as their handheld counterparts. Here we’ll tackle some of the advantages and disadvantages of using a compass app, versus a traditional compass. Compass apps are convenient for those that already have their phone on their outdoor adventures – just download an app, and you’re set. Compass apps usually come at little or no cost (compare that to high-end traditional compasses, and you’ll be saving quite a bit of money). Compass apps range from being very simplistic or minimalistic to having many additional functions, such as an altimeter, barometer, or GPS. Compass apps rely on a lit phone to work, meaning you can always use it in the dark! While many compass apps work well, your phone will eventually run out of battery. Traditional compasses are easier to use with a topographic or trail map. Compass apps may, in general, be less accurate than a traditional compass. 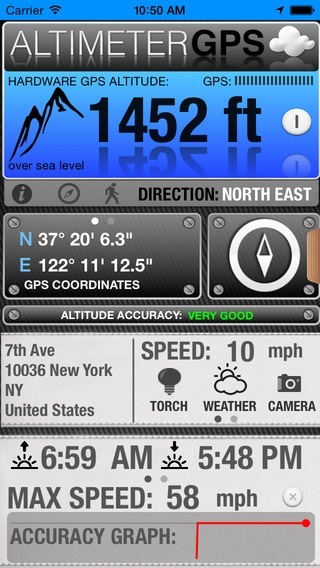 Compass apps are great, but do not have all the functions as many of the GPS devices on the market. If you’re like me and love using a traditional handheld compass, we’ve recently reviewed some of the best compasses on the market here. But for those looking for more of a modern take on the tried-and-true method of using a compass, these apps new to 2018 and 2019 may be just the thing for you. For sheer usefulness, very few apps stack up to the Altimeter GPS Pro. It does just about anything you could ever need a navigation app to do and probably a lot more. In its basic navigation mode alone, it has distance, direction, time traveled, speed information, and the total time elapsed but that is just scratching the surface of what this app can do. One of the most useful features is the variety of maps available to use in conjunction with the compass. You can choose from standard topo maps, aerial photography or hybrid maps to assist in getting where you want to be. It will show your altitude and can even show your estimated GPS accuracy so you know if you may be getting a little off course. The app tracks data on your speed, distance, time, location, and direction and allows you to share that data along with your starting and ending points and course via email should you want a record of if you need help. This app is far beyond a toy but a true fully featured navigation tool that could possibly save you from some troubling situations. Sometimes you don’t need all of the fluff that comes with most compass apps. You need something that is ultimately very simple but very, very powerful. If you have everything else you need for navigation on hand, why complicate things? This is where the Digital Field Compass comes in. It gets rid of all the junk and serves as a damn good compass that is light on battery use to preserve battery power. It doesn’t have maps or fancy backgrounds but it does have an amazing nighttime mode to preserve your night vision. The Digital Field Compass has a manual declination setting and can tell if you are having magnetic interference. This is about the best digital orienteering compass on out there but it doesn’t stop at land navigation. It has settings for pitch and roll that make it a solid maritime compass as well. For an easy to use compass, it’s hard to beat the Smart Compass which combines a lot of the features of the more powerful compasses on this list but in a simplified and easy to use format. It does the basics of turning your smartphone into an accurate compass but can also use your phone’s camera to show exacting bearings to a location you point it at. It also has Google Maps support to be able to see what is in the direction your plan on heading or to give you the direction to a known landmark. Other modes are a telescope mode, night mode or digital compass making this an all-around useful app. Like many of the other compasses, it also gives you your bearing information, coordinates, speed, and can-do screen captures. A small payment gets you a metal detector and the ability to share your information. All around, this is a solid app for navigating. This compass app does so much that it’s hard to wrap your head around it. 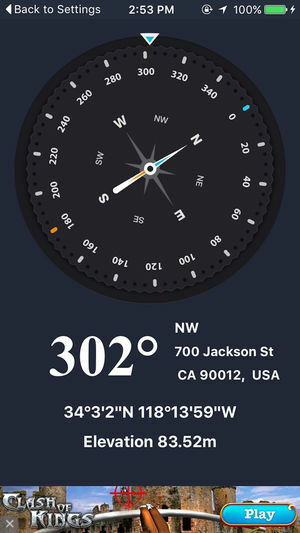 It serves as a standard compass but can be used in conjunction with several map backgrounds to get a better idea of what lies in the direction you are heading. You can navigate to known points by entering them manually or saving them so you can return later. You can save and see directions for multiple points at a time which is great for seeing proximity. For every point, you can see distance, direction, azimuth, elevation, speed, and time of arrival. This is not a simple app but uses the complexity well. 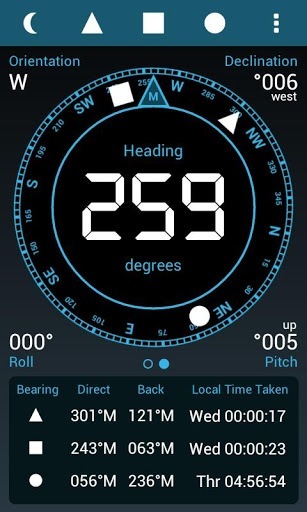 To round out the features, Commander Compass can show coordinates in dozens of formats, altitude, course, current, and maximum and vertical speed. It can be used to navigate by stars, the moon, or the sun and has extensive star charts. With all of this, it would be very hard to get lost. While at its heart the Compass 360 Pro is a simple program, it does add just enough extra features to make stand out of the crowd. There are compasses with more and compasses with less but none combine the ease of use and functionality of the Compass 360 Pro. This is a true global compass app that works around the world unlike some of the compasses out there that are good only in one hemisphere. It gives you degrees in decimal format and overall bearing making its use simple yet powerful enough for those with some navigation knowledge. One of the true shining stars of this app is its ability to show bearings in either true north or magnetic north making it handy for general navigation or for use with a topographic map. As the compass swings from one bearing to the next, the movement is smooth and look is clean with a classic professional look. This attempt to be a fully featured navigational aid comes complete with compass, GPS in multiple formats, distance and direction, navigation, waypoints, maps, routes, and even a speedomter. It’s hard to add anything more! But it does. There is a coordinate converter to switch between any of the common coordinate systems including Lat/Long, UTM, and MGRS so it can work with any physical map. You can share your files to your computer or other digital devices. It even has a pace counter to track walking distances. And that is all in the basic version. Upgrade to pro and you will get native Google Maps or the ability to add your own map server, GPS tracks that can be exported and shared, offline map support, and the ability to read routes from other GPS devices. This is truly a full-featured app though its use takes a little more practice to be proficient with. Of course, a compass doesn’t have to be all serious use, it can be fun as well. And that is where 3D Compasses really come into their own. 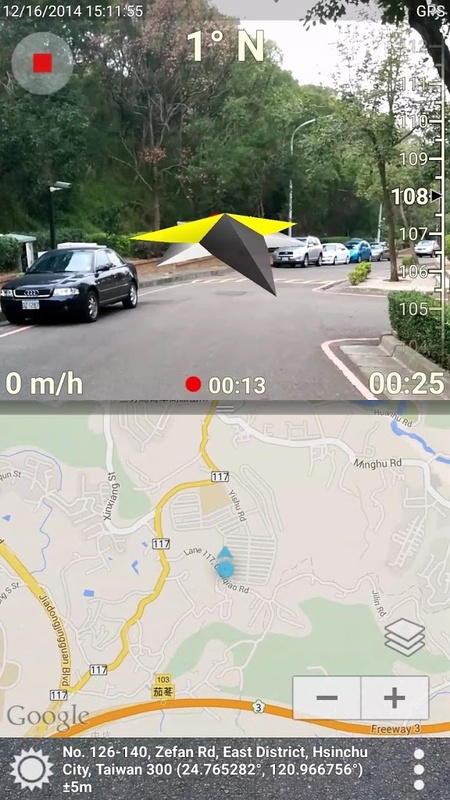 The augmented reality view uses the phone’s camera to show a 3D compass, map, coordinates, address, speed and time all on one easy to read screen. You can point the camera to get a bearing toward an object or take a video showing your course and export it for your friends to follow. It makes for a fun time in geocaching to add a little extra flavor and can really be a great tool for those interested in orienteering. By far the best use of this tool is for education. It can teach those new to compass navigation the relationship between bearings and travel. Set it up and get walking. Use it as a tool or for recreation. Anything you do with the 3D Compass Plus will be exciting. If you want a compass on your phone that functions identically to a real-world compass, you need the Gyrocompass. It is without a doubt the best-emulated compass you can get for your smart device. It is easy to use and immensely powerful as a classic navigation aid. Like a real compass, you can use it to find true north, magnetic north, and your compass bearing. It even displays magnetic strength so you can be sure of an accurate reading. It has a slope indicator just like some of the best standard compasses on the market and a bezel that can be rotated and used just like a real physical compass. This is truly the app for those who love classic navigation. There are no extra features or tracking. No maps, just a beautifully designed vintage compass layout. When you want nothing more or as a teaching aid, this is a great tool that does exactly what it says. If you have a smartphone that has a good magnetic sensor, get this app! With all these choices and differences in compass apps, we know you can pick one that suits your exact needs. 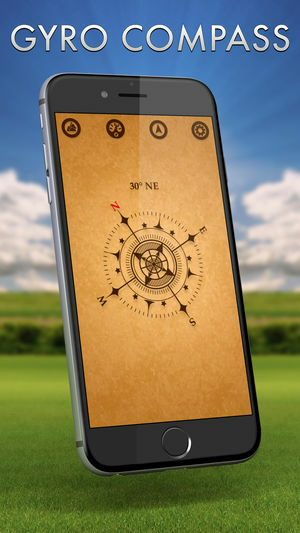 We suggest pairing a compass app with a traditional compass and map for the best results. Now get out there and use it! Q: Is a compass app the same as a compass? Yes and no. For the most part, a compass app will function just like a real compass but with the added features any compass app, no matter how simple, will have more functions. Q: Does a compass app replace a real compass? No. The one thing a real compass has over a digital compass is the lack of batteries. Its great to have the app but having a real compass to fall back on should you need it is just basic wisdom. Q: What Phones can use a compass app? 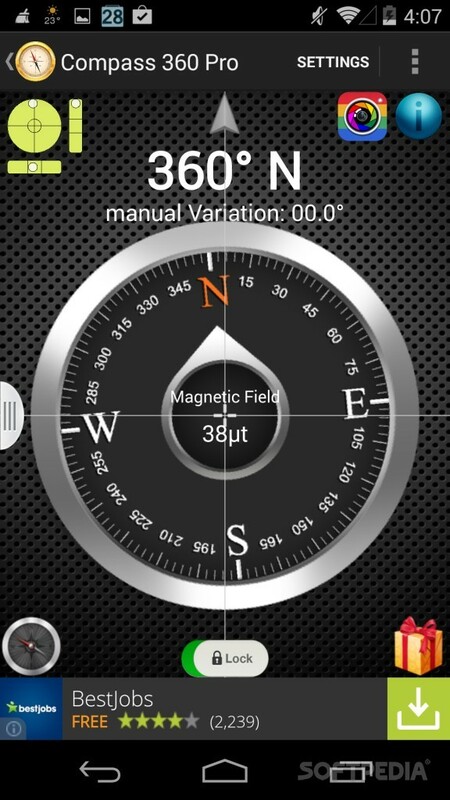 Most modern phones have the magnetic field detectors that allow a compass app to work. Check your phones users guide to see. 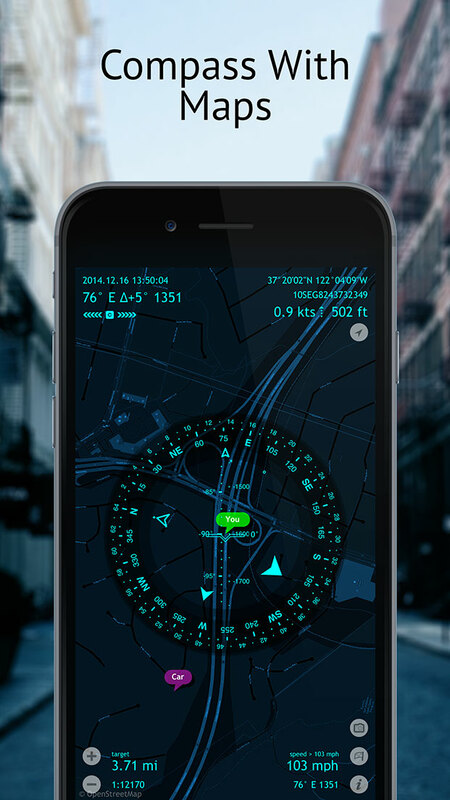 Some compass apps also use the phones gyroscope and GPS receiver if your phone has those available. Q: I am new to navigation, what app is best to learn? Since most of these apps are free, try a variety of apps. The best two for learning are probably the Gyrocompass and 3D Compass Plus. Q: How does a compass app differ from a GPS app? 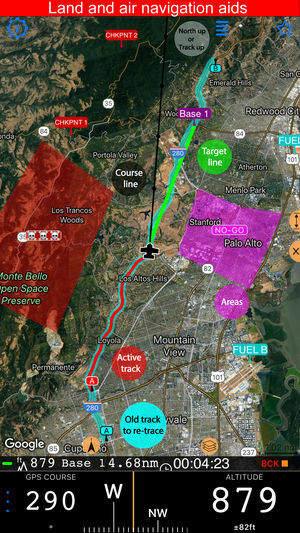 There is some overlap in the uses of each type of app but a compass app at its core uses magnetic fields for direction where a GPS app uses satellite information. In theory, a compass app will show direction more accurately than a GPS app. Q: How accurate are compass apps? The phones GPS has some issues with accuracy in general but is usually accurate enough for what most people need. The Compass on the other hand, should be accurate within a few degrees if calibrated correctly. Some of this will depend on your phones hardware but I have found most phones to be reasonably accurate. Do you need a cell tower connection to use these gps apps? Although rated low conpared to others, Compass plus app seems more accurate to me. Showed the North more accurately. Do you have android or iOS ? I have Android. Which is best general compass? Which is the one shown in the first picture featured above? Good to keep around your desk, office or car just incase your main cable breaks. They feel cheaply made and i feel like the maker sacrificed quality and reliability for looks. Still works great tho. Nice procurement and research of apps. I use the paid version of Compass 360 Pro and it works perfectly. It gives me the direction very accurately. Currently, I use a compass which is an inbuilt application in the phone when I purchased it. Do any of these apps offer the compass as a widget for my homescreen? We’ve updated new favorite list of 2018 included the link to the app store, hope you like it! Some of apps are old version, we are updating the article. Its real good advice for scouting. I have to tell you, the latest jets in the sky, Boeings Dreamliner, Airbus 350-900, cannot fly if the seal on the compass breaks and the fluid leaks out. They must have a working Magnetic Compass. No substitute. Most smartphones have the compass whick works well. No need for other apps.